Shamso Menu Build a restaurant website and use Shamso restaurant menu theme to show really good photos of your dishes. Increase online sales in this way. Earn more thanks to restaurant menu theme. Restaurant menu theme from UpMenu Adding new features to the website of your restaurant is never a bad idea. Now you have an opportunity to choose your favorite menu theme among many presented by UpMenu. Consider going for Shamso Menu which is cleverly integrated with the website. What is more, you can regularly make changes directly through CMS. Shamso Menu There are many different templates so make sure that you choose the one which mirrors the character of your food place. Shamso Menu is a menu theme which looks modern and stylish. Photos and descriptions are amazingly presented on a dark background. The special theme for the special restaurant Shamso Menu works especially well for food places which serve quality meals. The fancy, modern restaurant should present their menu in a very attractive way. 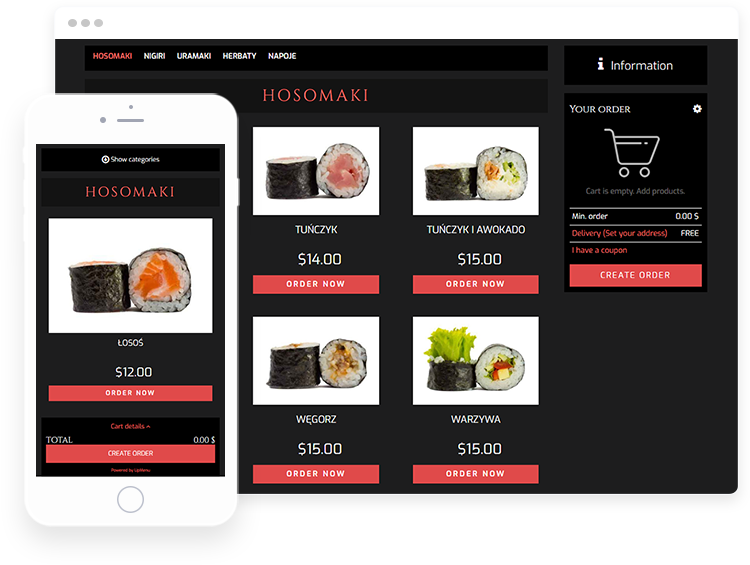 The template is really intuitive so customers are able to place orders online with no additional support. This way they will probably do that more often. Enjoy all of the advantages The best thing which you can give your customers is a real value. Shamso Menu theme is both pretty and practical, which is a perfect combination. When your guests see your professionalism, they will trust your restaurant more. As a consequence, it will help in the sales grow.